﻿ Kaleidoscope Piers: stoplights and Easter eggs, oh my! Kaleidoscope Piers: stoplights and Easter eggs, oh my! I would love to spend 5 minutes inside your mind. 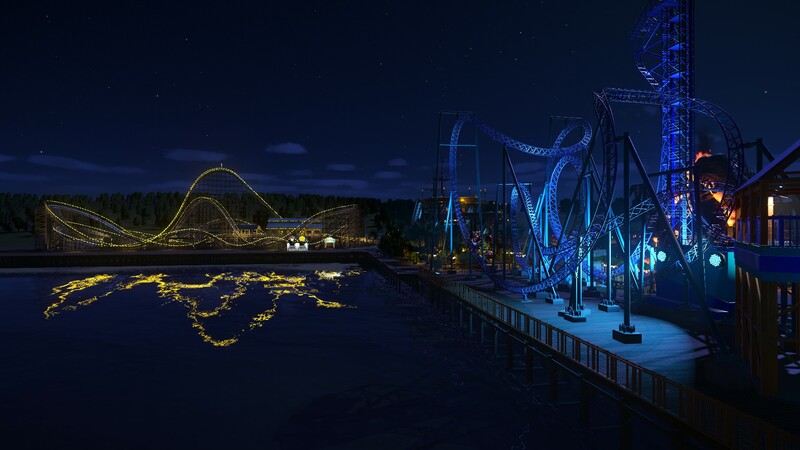 Pier parks aren't supposed to look this awesome. You did that in one night? It would take me a month of Sundays!!! Like the billboard idea, maybe they will be coming from Frontier! Hee hee! I think I found a neato solution...see below. I really like that! Especially the cut outs in the back. 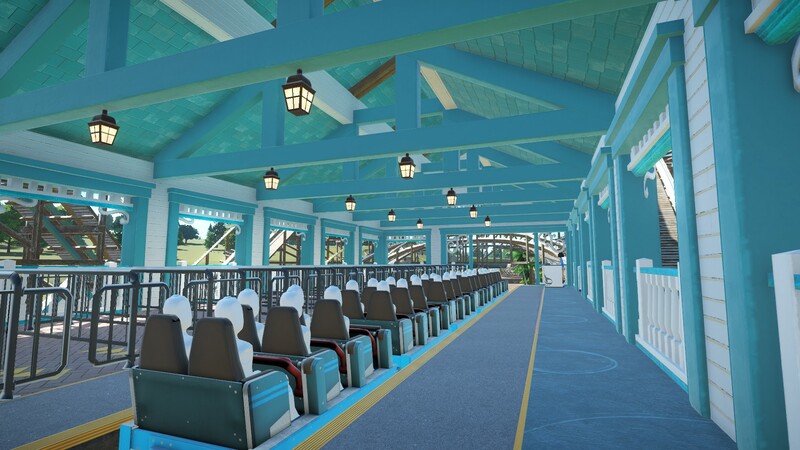 A nice twist on the Knott's mine train. 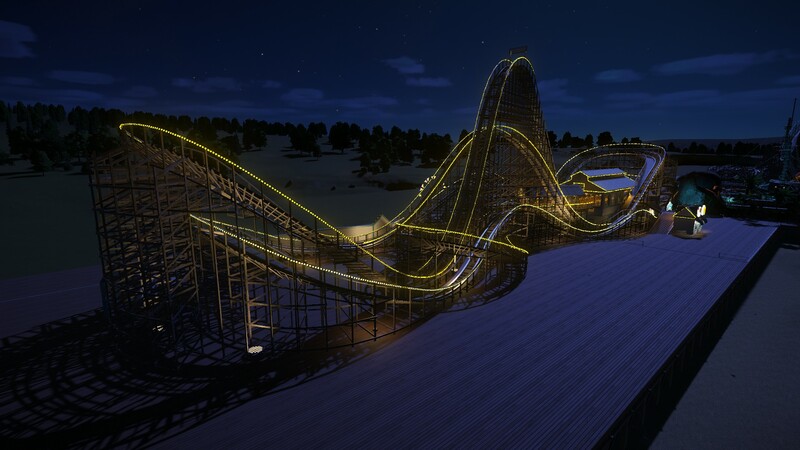 That log flume and the volcano coaster look INCREDIBLE! Wonderful small stuff. Love the size of all this rides and how you play with it to fit them n the boardwalk. Love the theming of the volcano coaster. 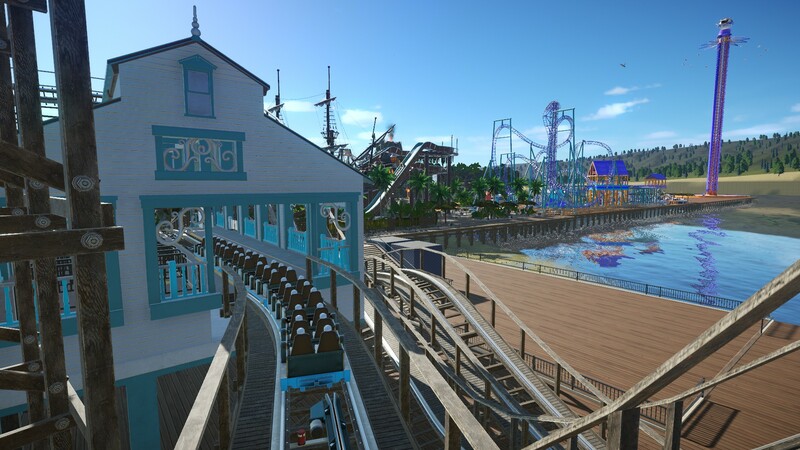 This my favorite type of park to make. I'm having lots of fun! I'll try to tone it down from now on. Hee hee! Thanks, Shyguy! 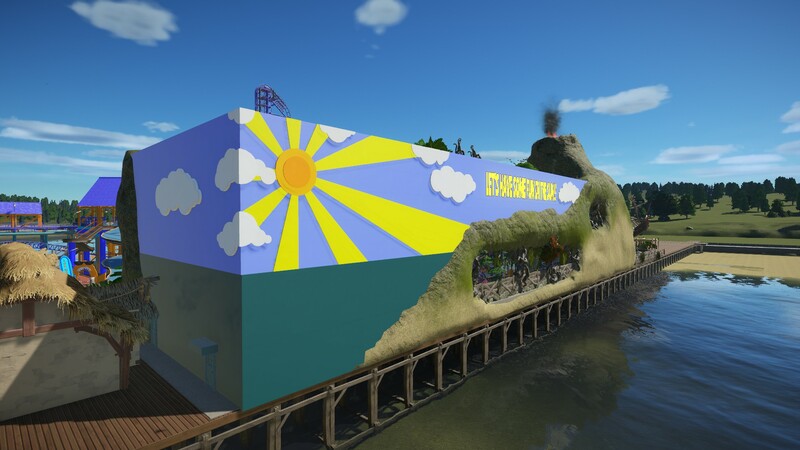 Okay...so how's this for a whimsical solution for Fire Mountain's ugly backside!?!? Um, wow. When you asked for suggestions I really tried to think of some things and none of them was THIS. THIS shouldn't be possible. In fact, I'm pretty sure it isn't because now I'm going to go try and then I'm going to fail miserably. 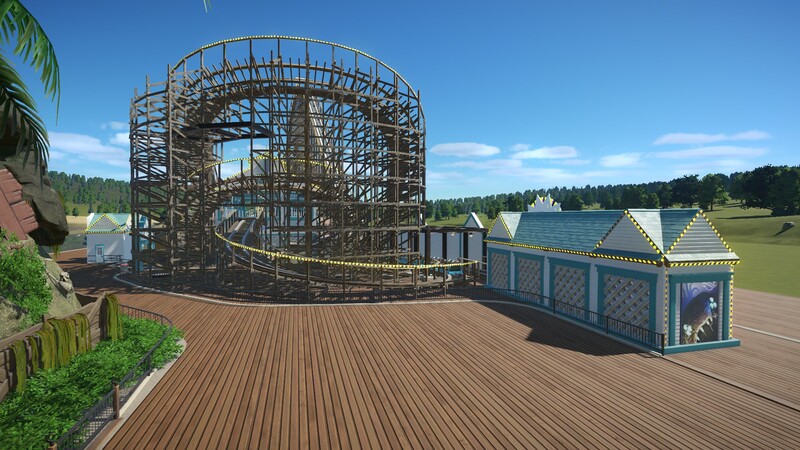 wauw, are any of these rides up in the workshop? 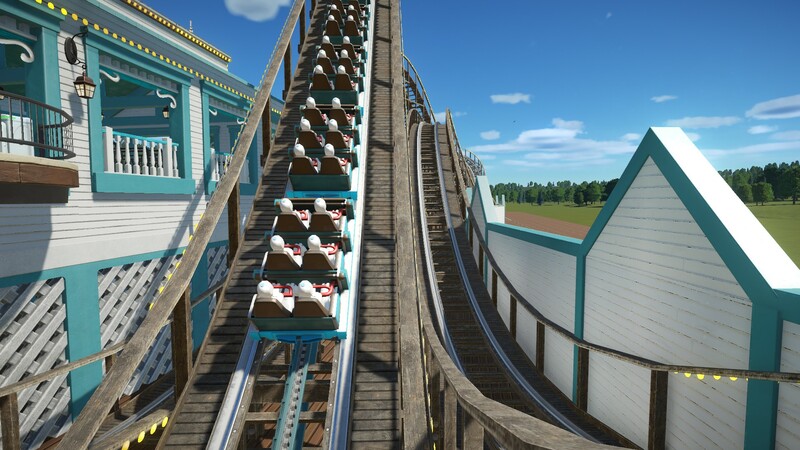 I would love to use one or two of them in a park I am making. Ha ha! Well, thank you very much. 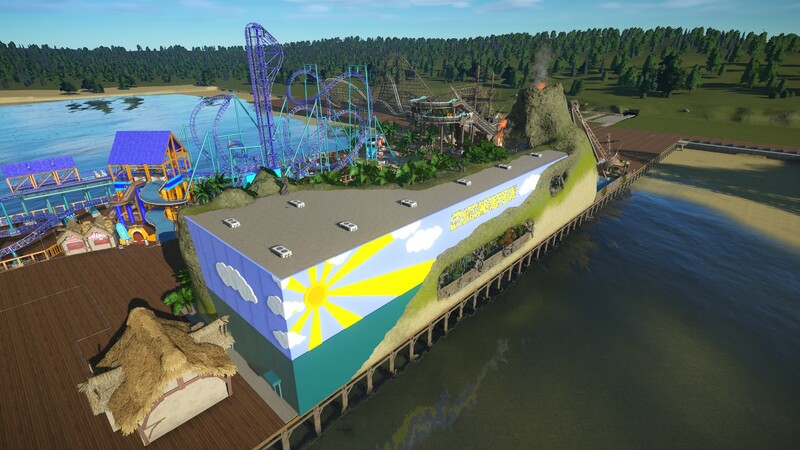 I can't upload most of the rides due to all the terrain work. 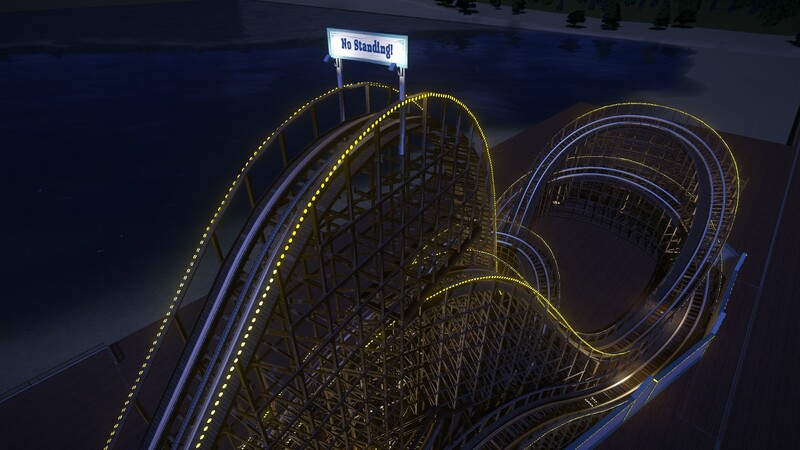 I will upload the park eventually though. 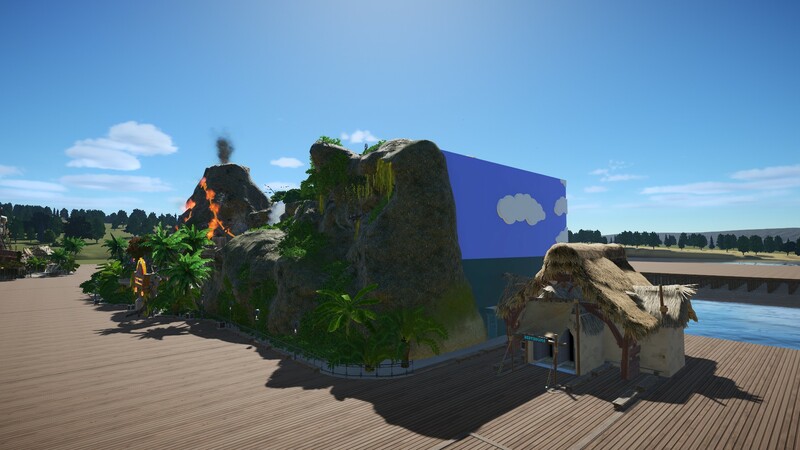 I tweaked the roof of Fire Mountain. I figured with all that fire in there, the peeps would need air conditioning. ....I don't check in for a few updates and I'm treated to THIS?!?! Holy cow, man, this is stunning. I love your work with the shapes (still) and that volcano--damn. I didn't know you could do so much with the terrain in a relatively small space. This is next-level stuff. So great! very nice. is the lava made from a sign or the free form pieces? It is a sign... "Editable Sign - Vertical Rectangle Small Lit" Really glows nicely at night. That "painted" back of Fire Mountain is bloody genius. I would never have thought of that. I would have been thinking, "it doesn't fit the theme of the ride. I can't do that". Of course, it wouldn't have worked at the front, but it's so, so right and fitting at the back. It feels like a proper seaside structure. I can really imagine it being one of those iconic landmarks that you see driving up the prom reminding you of childhood visits and getting you all excited knowing you're about to have a fun day. Brilliant. Thanks! 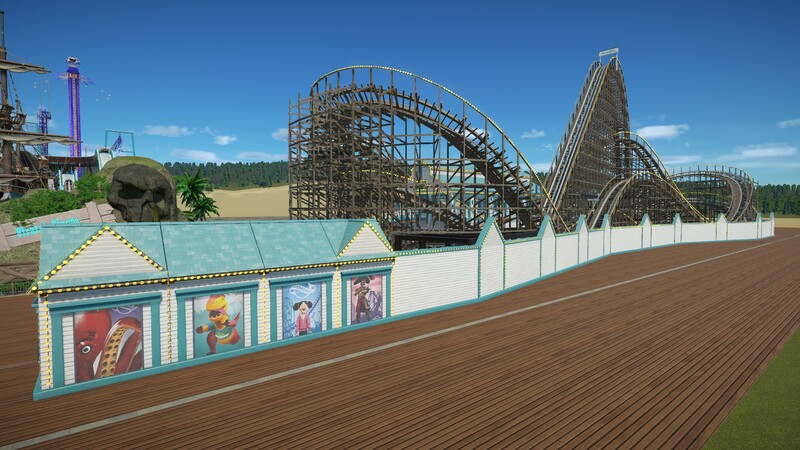 Yeah...I had to put something there because that side faces the other pier. Ha ha! That randomness is the best part! Hee hee. Well...I hope you can enjoy some of it. Love it. Love it. Love it. Looks like you're going to supplying all the next gen of video in Mall Motion Sims! I have to ask though, how do planters in piers work? I'd imagine trees would be few and far between on them. Ha ha! Shhhh...it's magic. 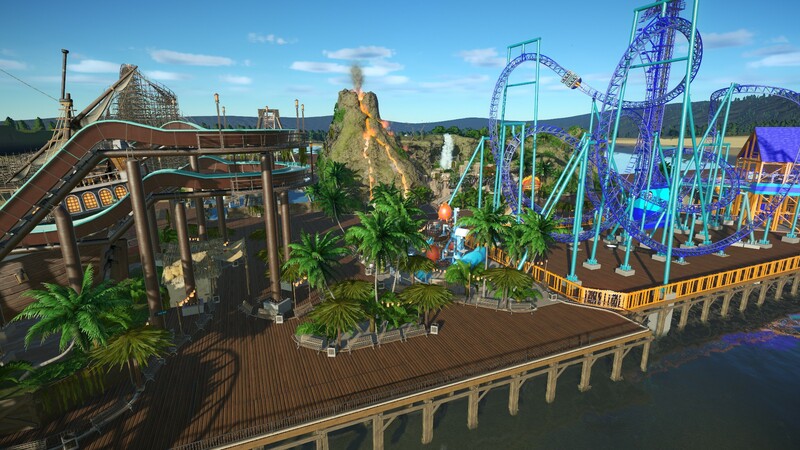 Actually, I guess they use raised dirt beds...but in my imagination...you can plant palm trees right into the boardwalk...no problem! Palms have like no root structure to them - it's plausible they could grow there happily. 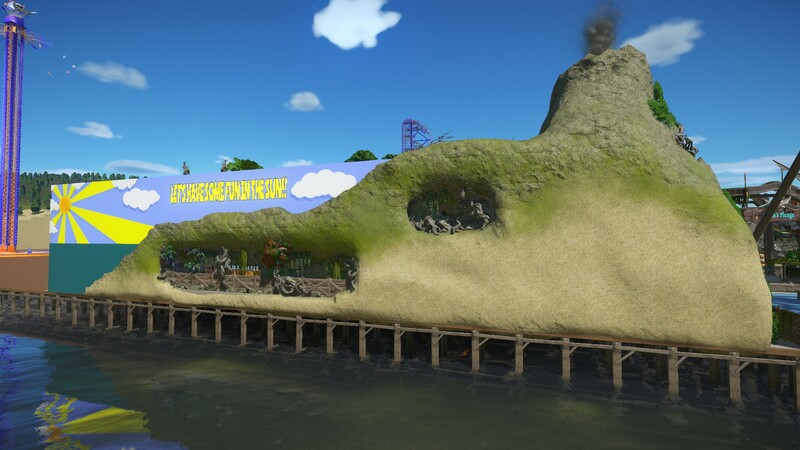 I love what you did to the back of your darkride structure...so brilliant. 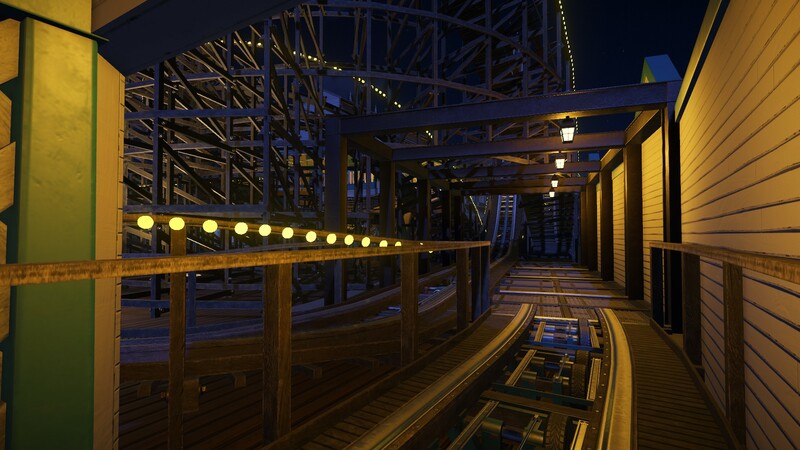 This minetrain-darkride-complex is a pure stroke of genius. I also like the colour-scheme of the tiger-shark. It is a really huge pier-park isn't it ? So rewarding seeing it filled in-you work fast! What there? Where did that come from. This is awesome! I love that dark ride enclosure. That's incredible! YES! More volcanoes. But mini! This is looking awesome. So in love with everything. Thanks! It's a full map of ocean and 2 large piers so far...planning a third as well. 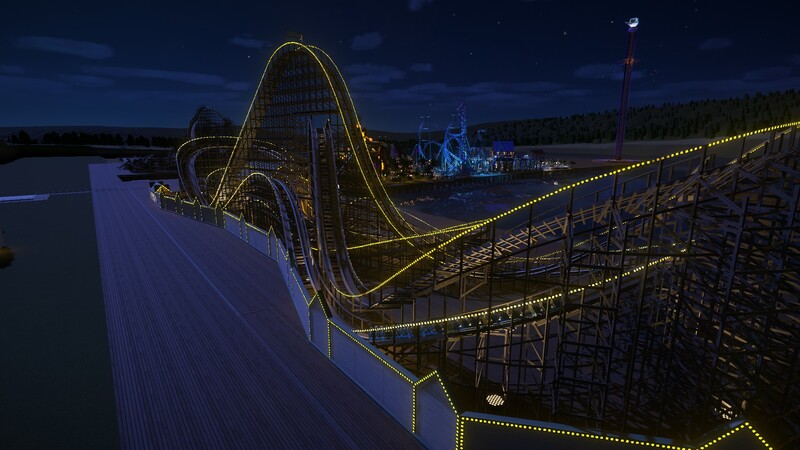 Been working on the Ocean Cyclone coaster for a couple of days...these chaser lights are taking forever! Got to be an easier way. Easily one of my favorite projects right now, and that's saying a lot with all the talent around this place. Having said that, I like to give fair warning when I plan to steal something -- that lattice work is perfect. A simple idea and yet I'd never thought of it. 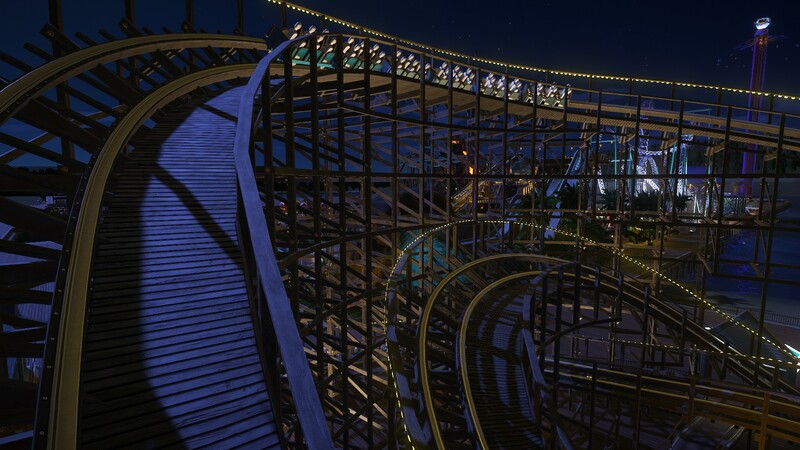 The lights might take a while, but the results are definitely paying off. Lookin' great as usual! Anywho, this park is amazing. keep it up! 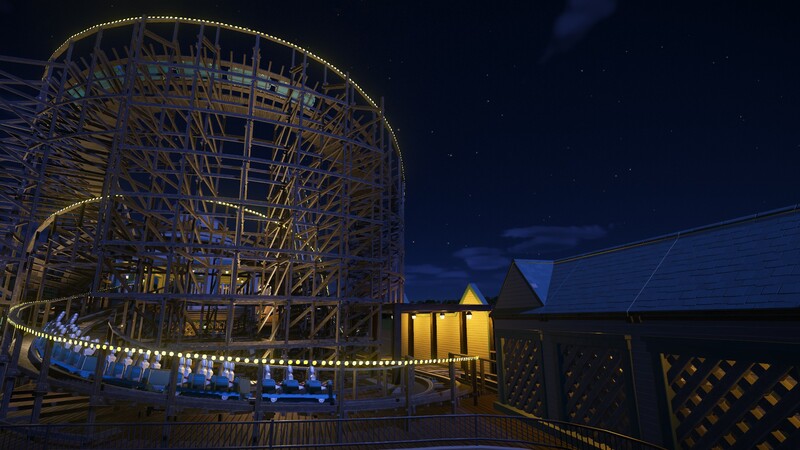 FINALLY finished the coaster lights! Took FOREVER! But lookie! Pretty neato! 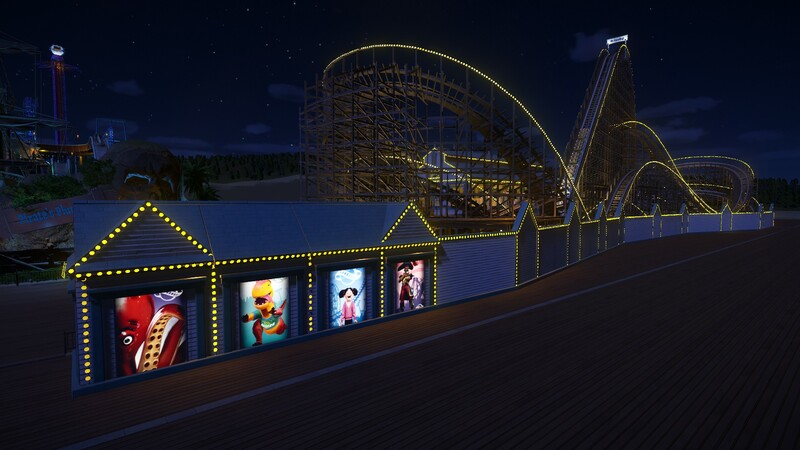 I'm gonna add lights to the station too. 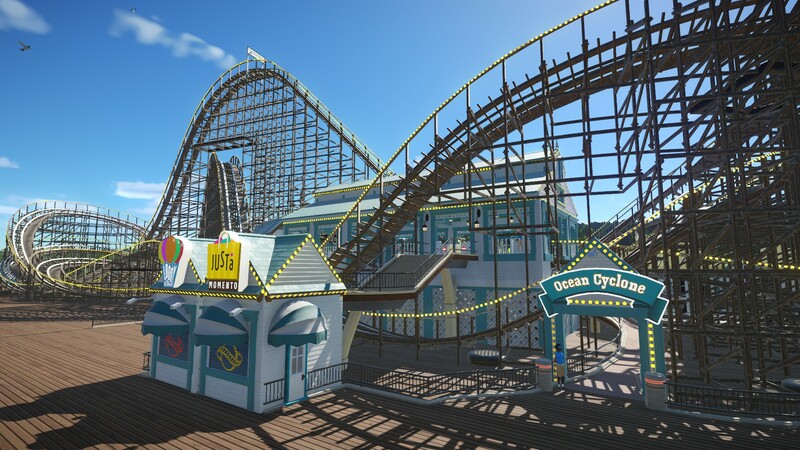 Just about finished the Ocean Cyclone! 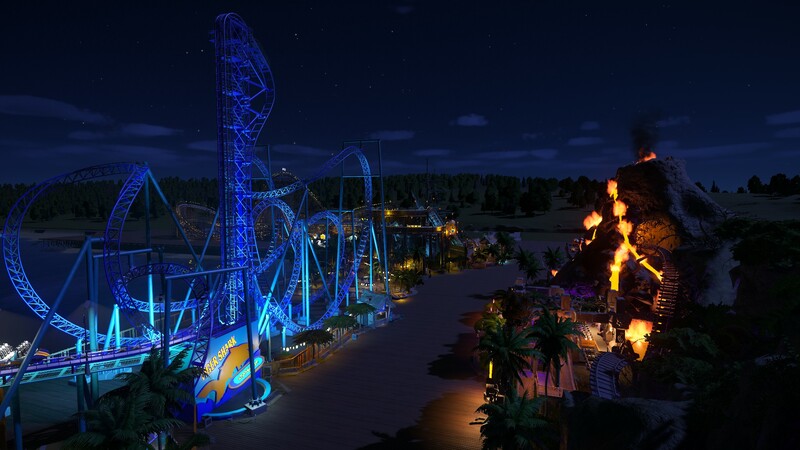 Also changed Tiger Shark's floodlights to blue. Something so simple yet never before seen (at least, to my knowledge). 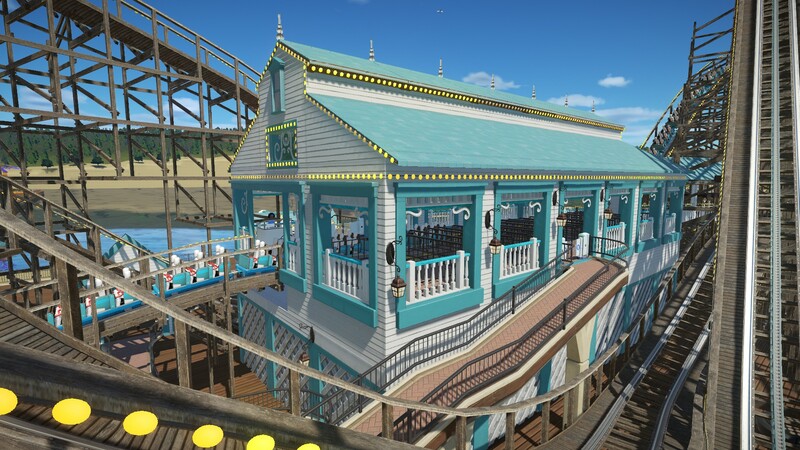 For thinner lattice work (or a trellis), you might want to try out the veranda pieces so long as you have something to cover the... back area because parts of it will stick out. It can be sort of awkward. But anyway, enough of that. I can't believe I missed out on so many fantastic updates that would seem (at least for me, and I imagine most others) to take days or even up to a week to work on yet these were dished out at such a fast pace and yet, it didn't feel at all like you should have spent more time on them before posting. 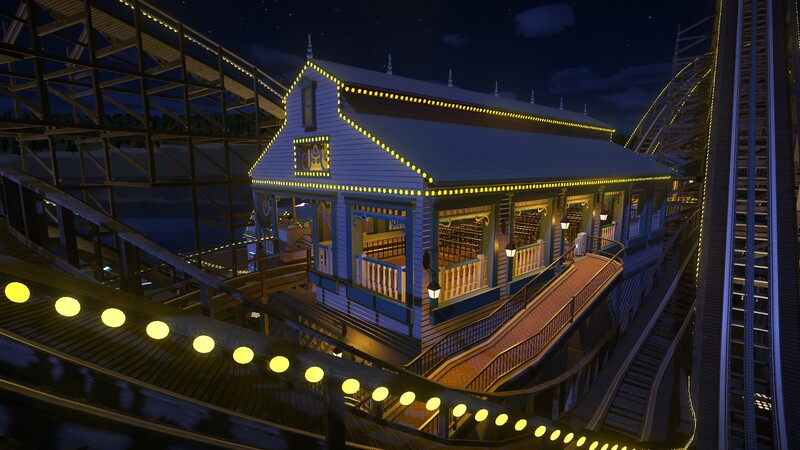 So many brilliant things to comment on here, the facade on Fire Mountain, that extra woodwork + lighting on the log flume to give it that extra "pier" feel (to compensate for the fact that it's not built around lush landscaping, you know, that's how most people make their log flumes attractive but since you're on a pier, you had to do it differently). 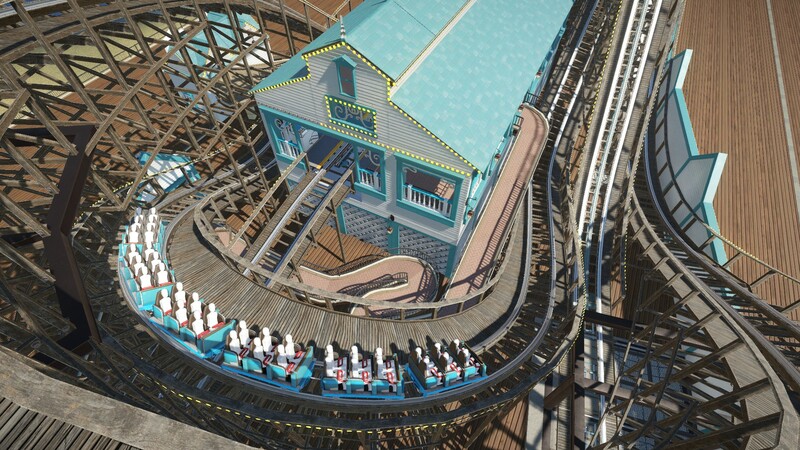 And Ocean Cyclone is just... the epitome of a pier-style woodie with all aspects (just the right amount of theming, coloring, architecture, appropriate fencing, a believable layout, etc) covered. You not only took something on board that hasn't been attempted on PC yet (again, to my knowledge...) but you've set the bar pretty high for anyone who wants to try their hands on something similar. "It's weird that pirates would go shore to shore looking for buried treasure when the real treasure was in the friendships they were making."